R LMi is an interesting Mira star that has been observed by AAVSO observers and members since 1865. Over 21,000 observations are in the AID from over 900 different observers as can be seen in the light curve shown below which displays all observations in the AID. It is one of the Legacy LPV Program stars. It was observed initially in the 1860’s-1870’s before a cessation in observations occurred. Reasonable coverage did not commence again until the establishment of the AAVSO in 1911. Its spectral class is M6.5e-M9.0e according to the VSX and is classified as a Mira. The GCVS lists R LMi as having a visual magnitude range of 6.3 to 13.2 with a mean period of 372.2 days. A DC DFT analysis of all observations in the AID shows a mean period of 372.9 days. A number of harmonic and alias periods are also present. The phase plot based on all observations in the AID is shown below. 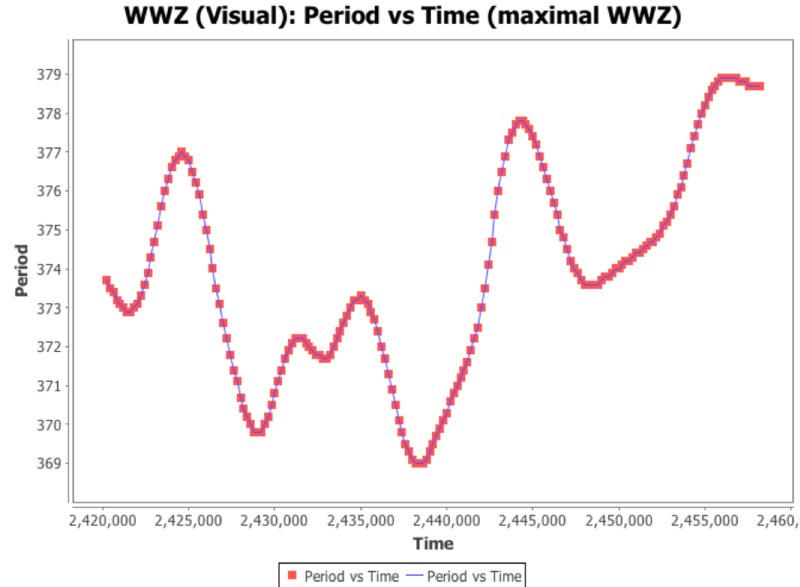 A WWZ analysis has shown that the mean period has been relatively stable remaining between a range of 370 to 379 days with a slow meandering behaviour which is quite common for many long period variables. 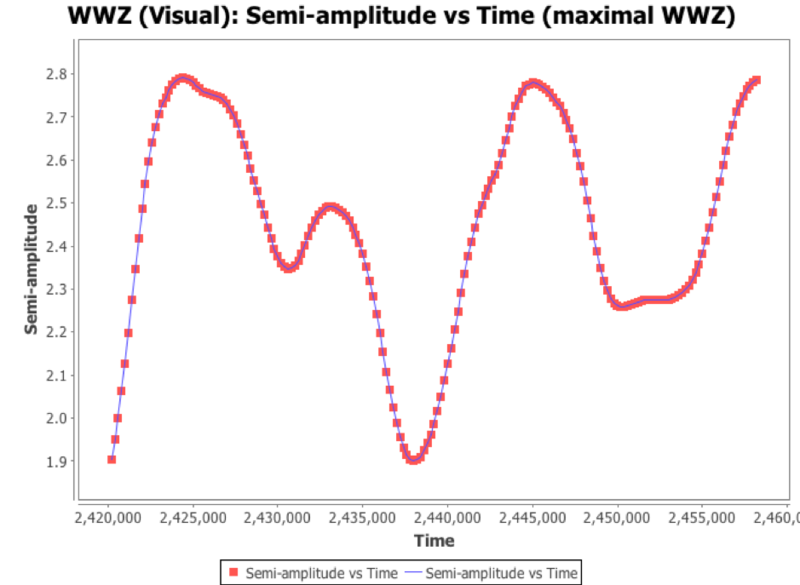 Plots of period versus time and semi-amplitude versus time are shown below. There does appear to be a direct correlation between the mean period and the semi-amplitude. When the mean period is peaking, this tends to correspond to a peak in semi-amplitude. As can be seen from the overall light curve at the top, it appears as though R LMi mean brightness varies over a much longer time period. The plot below shows the mean magnitude based on all observations made in each 372 day interval (blue line). Even though the overall observational history is quite short, it appears as though the mean magnitude possibly varies with a period of approximately 18,000 days. However looks can be deceiving! As with a number of other Miras with mean periods close to 1 year (365 days), it appears as though this longer term variation is an observational artefact. Closer examination of observations for each cycle tends to show an increase in the number of observations when the star is favourably placed in the sky. This typically occurs over an interval of several months. Therefore when all observations are averaged over a defined timeframe (such as the mean period), there is a significant bias based on when the higher density of observations was made relative to the phase. Since the mean period of R LMi only differs from a period of 1 year by 7 days, it would be expected that the bias in the mean magnitude would traverse through a complete cycle in approximately 19,000 days which is not far from the 18,000 day period evident in the mean magnitude plot. Cotton et al, reported an assymetric outer envelope surrounding R LMi. As Miras go through the asymptotic giant branch (AGB) phase, the core exhausts its fuel and collapses while the outer envelope becomes very extended and is eventually lost. This may lead to formation of a planetary nebula. R LMi is a well-known emitter in SiO masers (maser stands for Microwave Amplication by Stimulated Emission of Radiation). Oxygen-rich evolved stars such as R LMi typically host SiO, OH and H2O masers in their circumstellar envelopes. R LMi is an interesting Mira to follow so all are encouraged to maintain the excellent coverage.